Whether your goal is luxury bathroom design or small bathroom remodeling.You want your bathroom to give you comfort and contemporary style. But there are so many choices. Elegant granite or marble countertops. Beautiful vanities and cabinets. Single or double bathroom sinks. Ceramic wall tiling and laminate flooring. Whirlpool tub or soft bathtub. Our design professionals in bathroom remodeling, will work with you closely so that your bathroom reflects your taste and sets just the right tone. To learn more about luxury bathroom design, click here. If you haven't already begun research on bathroom remodeling, you will be amazed by the possibilities. Just the choices in tiling will astound you - everything from standard ceramics to exotic tiling made from stones and fossils is available at BathRooms NYC Our selection of sinks, faucets, tubs, and bathroom cabinetry is also extensive, allowing you to create whatever style you dream of. 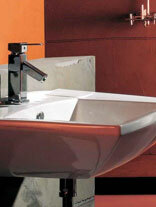 From the latest technology to premier products, BathRoomsNYC can get it for you. We'd like to invite you to visit our showrooms and browse our online gallery, where you may find ideas for your home. BathRoomsNYC carries a wide selection of toilets in a variety of styles,. Both comfort and style should be considered when choosing a toilet for your new bathroom. Toilet seats come in two basic shapes, rounded and elongated, but they're available in a number of materials. The tank and toilet seat arrangement may be all one piece, or disconnected from each other. When looking at tanks, you may want to take into consideration how much water is used, since less water is both environmentally sound and lowers your water bill.. Experienced professionals to build Your dream bathroom. Form Kitchen & More, we create cabinetry masterpieces for your home with distinct style and expert craftsmanship. As a leading New York city-based manufacturer of high-quality cabinetry, we cater to all areas. New York General Contractor offering a one-stop-shop for renovation projects, including interior design, materials and complete remodeling services for your home and office in New York City.